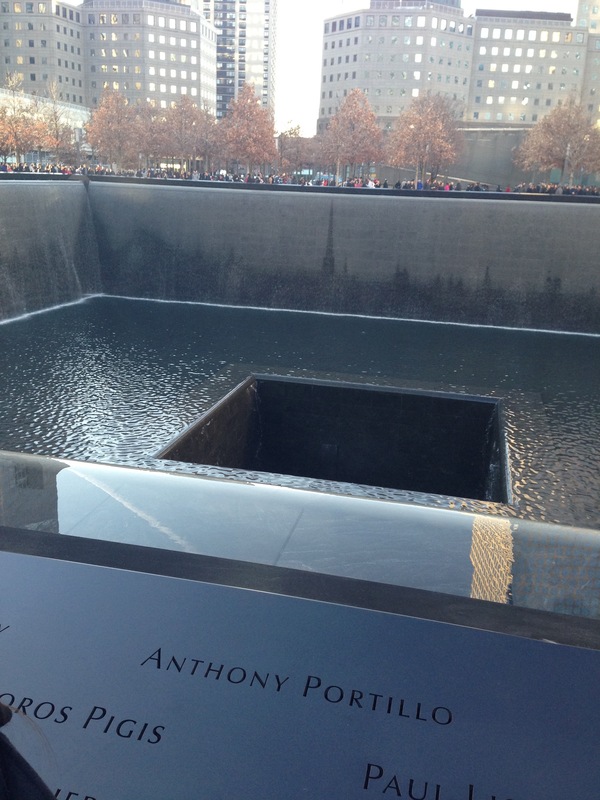 The 9/11 memorial in New York City is located at the site of the former World Trade Center. Photo courtesy of C.Arida/Setonian. As I sit here this morning drinking a cup of coffee, scrolling through my Twitter feed and listening to a news broadcast reflecting on the 15th anniversary of the Sept. 11 attacks, I begin to think about where I was on this day 15 years ago. I was five years old, sitting in my kindergarten classroom, anticipating what letter of the alphabet we’d learn today. While I don’t recall the exact events, I imagine a sense of panic as teachers got called into the hallway and came back with panicked looks. Moments later, worried parents trying to stay positive would arrive to bring us home. We would be curious, yet ecstatic that we were leaving school early. We could sense a panic in our mothers’ faces but not be old enough to pay too much attention. Our little sister would be giggling in her car seat because to her it was just another day of Barney and naptime. We’d go to the high school next; our older siblings would get in the car and they would be crying. Now we know something is wrong and we start to panic ourselves and ask questions. Mommy says it’s going to be okay, that we are just going home. When we get home we are told to go play in our rooms and not watch the TV. As we are playing with our Barbie dolls and Hot Wheels cars we hear the TV downstairs; it sounds like the thing mommy and daddy watch every morning. The one where they just talk to each other about the rain or snow or other stuff mommy says is important to know. Today they keep talking about planes; “I love planes!” They also talk about New York City; Mommy says we are gonna go there one day to see the tallest buildings and brightest lights, and somebody called Lady Liberty. We sneak downstairs because we were told not to watch TV and now we are curious. We see daddy, holding mommy; they are both crying. We look at the TV and see a plane crashing into a really tall building over and over, the building explodes, again and again. We run back upstairs because although we are too young to really understand what is going on, we know planes aren’t supposed to crash, and we know that when everyone is crying something bad has happened. We don’t say a lot now, but soon we will start to ask questions, and slowly we learn about the tragedy of that day. The day that started out just like any other but turned into one that stripped the innocence of our childhood. 9/11 marks the day we realized bad things do happen, people die for no reason and life can be hateful and unfair. We also learned that when bad things happen, we fight back by coming together. Unfortunately, we have forgotten this message since that day. We are no longer fighting together. Instead we are torn apart by race, gender, sexuality and religion, all of the things that make us who we are. Instead of trying to bring the country together, the candidates are tearing each other and voters apart, ultimately tearing America apart. Instead of being the country of freedom and newfound life, we are turning people away to go back to their life-threatening countries of poverty and war, sickness and death. Every year on this day we come together as a country to reflect on the events of that day and remember the brave souls who lost their lives. I hope that today, 15 years later, we can remember the unity of our country during the days that followed this horrific tragedy. I hope we can remember this and realize that this is what makes our country great again. If we want to be the greatest country, we have to come together. Our country won’t survive if we continue to be torn apart by the things that make us human; these things we cannot change. Poverty, we can change. Education, we can change. Violence, we can change. Lives, we can change. If we can change these things for the better, America will be a greater country than it is today. If we can come together like we did 15 years ago and stay together, our country and our people will prosper. I read a post on Twitter that claimed this year, students in their freshman year of high school will be learning about 9/11 as a historical event they were not alive for. To me, this is astounding. For fifteen years we have been reflecting on an event that has changed the way we live. For kids today, this is all they’ve known, this is their life. They do not understand the impact this event had on our country. This year and for years to come is our ultimate test. Can we continue to reflect on 9/11 and teach these kids what it means for our country, what it means to their lives? Can we teach them that our country can come together when we need it to most? Or will we teach them to use it as yet another way to divide our country and the people in it? Today may we remember the lives that were lost and think about the lives that will soon come. What America do we want them to live in? The Setonian invites students and faculty at Seton Hill University to share their stories about Sept. 11. Feel free to comment here or send letters to the editor.